In our class on history of religious life, Fr. Anselm Ramelow, OP invited brothers to give ten minute presentations on topics pertinent to religious life in the Church’s history. In the following few posts, we will share the fruits of our contemplation. In this installment, Br. Gregory Augustine will discuss St. Basil the Great (also known as St. Basil of Caesarea) and his monastic rule. St. Basil the Great was born into a devout Christian family in Caesarea of Cappadocia (near the geographical center of modern day Turkey) around 329. Many of his family members are considered saints of the Church, including his grandmother St. Macrina the Elder, father St. Basil the Elder, mother St. Emmelia, older sister St. Macrina the Younger, and his younger brothers St. Gregory of Nyssa and St. Peter of Sabaste. He grew up in the countryside near Neocaesarea in Pontus (modern day northeastern Turkey) in the family estate, but returned to Caesarea around 340. There he began his formal education and met St. Gregory of Nazianzus, with whom St. Basil forged a life long friendship. The two later moved to Constantinople and subsequently Athens (between 349-356) for further education. It was said that both St. Basil and St. Gregory were so diligent in their prayers and studies, that in Athens, they only knew the street leading to the school from their residence and the one leading to the church. Interestingly, it was also in Athens that they studied with who was to become Emperor Julian the Apostate. In around 356, St. Basil returned to Caesarea and taught rhetoric. As he was about to launch a brilliant career as an orator, he met the hermit Eustathius of Sabaste. Deeply inspired by the witness Eustathius of Sabaste of and compelled by his own sister Macrina, St. Basil decided to renounce worldly prestige and was baptized around 357. Following this conversion experience, St. Basil visited monasteries in Egypt, Palestine, Syria, and Mesopotamia to study monastic life. Upon returning, he began a monastic life himself in Arnesi of Pontus, on the bank of the River Iris around 358. He initially lived in solitude, but found no attraction. He then gathered a number of like-minded disciples around him, including his brother Peter, to start living coenobitically (i.e. in a community). Right around this time, his mother and sister also started a monastic community for women across the River Iris. During this five-year monastic period, St. Basil compiled what was to be known as “the Rule of St. Basil”, which has shaped the monasticism in the Eastern Church for centuries. He also invited St. Gregory of Nazianzus to join him in Arnesi in 358. Together they worked on an anthology of Origen, known as “the Philocalia” (not to be confused with a later collection of sayings of desert fathers under the same title). In 360, St. Basil attended the First Council of Constantinople. Interestingly, he initially supported “the Homoiousians” (the Christological theory arguing that God the Father and God the Son are of “like substances”, but not of the same substance or consubstantial) but soon found this position untenable. Eventually, St. Basil supported “the Homoousians” (i.e. God the Father and God the Son are of the same substance), which was deemed orthodox by the Council. It was during this time, his talent for ecclesial administration was discovered. St. Basil was persuaded to be ordained as a deacon around 362 in Caesarea to assist the archbishop. During his early tenure as clergy, he cooperated with St. Gregory Nazianzus and wrote theological treatises defending the divinity of Christ against Arian teachings. However, as Eusebius, the Archbishop of Caesarea at the time, grew jealous of his influence, he resigned from his responsibility and retired to Pontus briefly. Felicitously, the two reconciled in 365, and St. Basil returned to Caesarea. Around this time, St. Basil was ordained as a priest. Upon the death of Eusebius in 370, St. Basil was elected to succeed Eusebius as the archbishop, despite some vocal opposition. Due to his reputation of being a staunch defender of orthodoxy, St. Basil was persecuted by the Arian emperor, Valens, and the local prefect, Modestus. Unfortunately, his pleas for support to Western bishops were largely viewed with indifference at best, or worse, suspicion, including by Pope St. Damasus. During his struggle with Emperor Valens, St. 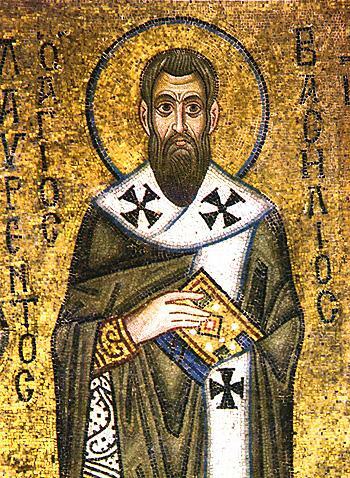 Basil also alienated his dearest friend, St. Gregory of Nazianzus. When Valens divided the Province of Cappadocia in two, St. Basil, being the metropolitan archbishop residing in the capital of the new province, sought to bolster the number of orthodox bishops (i.e. the bishops who did not subscribe to the Arian heresy) within it by appointing his allies as his suffragan bishops. He appointed St. Gregory of Nazianzus to a desolate and remote town called Sasimas despite the protest from St. Gregory. It was not clear if St. Gregory ever physically set foot to his see. It is worth mentioning that during the ecclesial service of St. Basil in Caesarea, he started a massive charity program of feeding the hungry, healing the sick, and clothing the naked, known as “the Basiliad”. According to the account of St. Gregory of Nazianzus, it was like another city outside Caesarea. After a life of asceticism and selfless service to the Church, St. Basil died on Jan. 1, 379, only a few months after the death of his archenemy, Valens. Live together for the sake of mutual help, comfort, instruction, exercise of virtue, efficacy of prayer, and security from danger. None without trial should be admitted into the fraternity. Monks should dispose of their wealth to the poor and needy. Children, with the consent of their parents, in presence of witnesses, may be admitted. Stinted measure is to be appointed for eating and drinking. Monks’ apparel be plain and decent, and that they wear a girdle. Next to God, monks are to be obedient to their superior. The good qualities which the superiors ought to have. The superior of the monastery first reprove the offenders with meekness and gentleness; but if they prove obstinate, and will not be reclaimed, then he is to account them as heathens and publicans. The superior suffers not the least offence to pass unreproved. The monks should confess their faults to those who are the dispensers of holy mysteries. The monks should possess all things in common. Men of estates are to render to their kindred what is their due, and the remainder to the poor. None that are entered should return to their parents’ houses, unless to give them instructions and that is to be done by permission of their superiors. Whosoever defames, or patiently hears his brother defamed, is to be excommunicated. No man does his own will in the monastery, or the least thing, without the superior’s leave. Monks debar no man from entering into the convent upon trial, or give him any offence. The measure of eating and, fasting is to be set by the superior. He who scorns to receive a garment, when presented to him, ought not to receive it when he afterwards asks for it. Those who by their own fault do not come to dinner at the fixed time, ought not to eat till the next day, at the same hour. None ought to give the least thing to the poor, but by the hands of those who are ordained for that office. Monks should be careful of the utensils appertaining to the monastery, no less than if they were the holy vessels belonging to the altar. Monks must apply themselves to handy crafts, that so they may be helpful to others. As a token of humility, monks wear sackcloth, and speak with moderation. That the monks are not to discourse alone with women. He who is the director of the nuns – That when he confesses a nun, or a recluse, he ought to do so with decency, in the presence of the abbess. As discussed above, St. Basil compiled his rule in the late 350’s in Arnesi of Pontus, for his small community. Little did he know, the Rule had had such a profound influence for centuries to come, that it lays the foundation of coenobitical life in the East. Until this day most of the monasteries in the Eastern Church still use the Rule of St. Basil as a guideline of their life. This is a sure testimony of the prudence and wisdom of this preeminent Father of the Church. This entry was posted in 2012, Novices, Studies. Bookmark the permalink.